We’re doing something we’ve never done before: we’re going to replay one of our old episodes! This interview between Michael Schein and Michael Roderick is a little over a year old, but the content is as relevant and helpful as ever. Enjoy! You’ve succeeded in building relationships and broadening your network. Now the time has come to stop courting your connections and get down to the nitty-gritty. It’s time to ask for what you want. Truth is, most of us lack the proper framework to ask for what we need in a way that will get us game-changing resources without alienating valuable connections in the process. 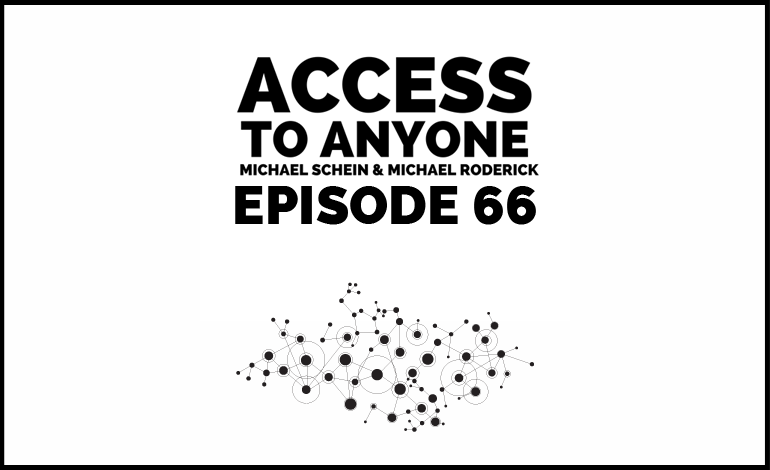 In this episode, Michael Schein interviews co-host Michael Roderick (the mastermind behind the art of the ask) on how to lay the groundwork for a successful ask, the science behind the art, and how we can use our inherent love of problem solving to get us what we want. The surprising psychological and biological principles behind asking. How to indirectly ask your connections for what you want. How to tailor and refine your language for every kind of ask.